A pilot programme using a robotic police officer in San Francisco has ended as quickly as it began after the machine waged a war on the homeless. The idea seemed sound enough: the non-profit animal rescue group, San Francisco SPCA, employed the services of a $6 per-hour rented robo-cop to monitor the streets around its premises with the sole aim of cleaning up the area, which had become a hotbed of harassment, vandalism, break-ins and drifters. The SPCA believed the 180-kilo, 1.5m tall, slow-moving robot (travelling at a speed of up to 4kms per hour) equipped with four cameras (capable of reading up to 300 license plates per minute) and sending alerts when trespassers or people on a “blacklist” were in an area, had a lot of potential when it began using the machine to patrol the carpark and footpath areas around its shelter. The building had been broken into twice and employees had become fed up with harassment and catcalls. The robot, they hoped, would be able to snap photos, record security footage and then notify shelter employees or police during an emergency. But within a month, K9’s employment was terminated, despite its success in reducing crime and vandalism. The unit was battered with barbecue sauce, smeared with faeces, covered by a tarp and nearly toppled. It created a public relations nightmare for the SPCA by taking hundreds of photos per a minute without people’s permission and was accused of discriminating against homeless people who had taken up refuge on the sidewalks. After a complaint about a near-collision with a local resident walking her dog, the city ordered the SPCA to keep the robot off the sidewalks or face a penalty of up to $1,000 per day for operating in the public right-of-way without a permit. The SPCA’s robo-cop is part of a growing list of uses for robots cross San Francisco. They are being used for all manner of purposes, ranging from rental agents to food couriers. Local authorities have been grappling with the issue for some time. While the city’s Board of Supervisors moves toward finalising regulations on robots that roam the sidewalks to deliver food and goods, it must also find a way to handle security robots that patrol public sidewalks. K9 is not the first machine to have a short-lived security career. Earlier last year, a K5 robot patrolling Washington Harbour ended up in a fountain, halfway submerged. Images of the machine’s demise were circulated on social media and, eventually, a memorial with flowers and letters was set up to mourn the short-lived career of “Steve”, as the machine came to be known. Automated police stations are being considered to bolster the Victoria Police service. Victoria is looking at Dubai’s “automated smart ­stations” as it continues to consider options for its self-service kiosks, allowing anyone to report crimes 24/7, file criminal complaints and talk to police in private cubicles via video link. Other services may also be incorporated, including paying fines, dropping off lost and found items, and social support for victims of family violence. Dubai Police introduced its first robot police officer last year. The machine’s functions are currently limited, but the Emirate has big plans for the future. 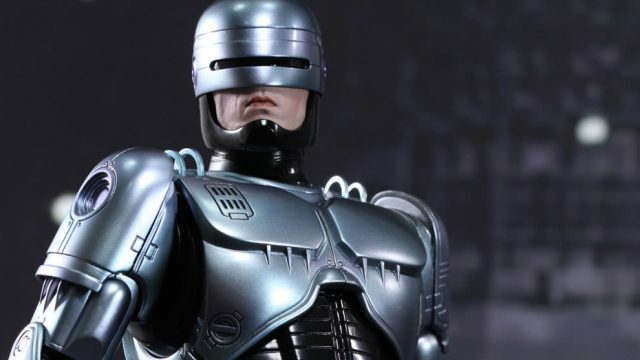 By 2030 it wants robots to make up 25% of its police force – including fully functioning androids capable of chasing down suspects and making arrests. In China, an E-Patrol Robot Sheriff is currently on the beat in Zhengzhou East Railway Station. It has facial recognition technology and can match faces to police databases. It will follow a wanted person until the police arrive. The LAPD also uses a robot called the TALON. The machine was made to assist law enforcement with bomb disposal, communications, hazmat situations and surveillance. Another robot in the pipeline for forces around the globe is the Throwbot, a dumbbell-shaped robot which is small but effective. Weighing in at just over a pound, the Throwbot can be thrown into a scene to send back audio and video. Throwbot can be used to locate armed subjects, confirm the presence of hostages or innocent civilians, listen in on conversations and reveal the layout of rooms, all of which are key in high risk situations. While there is no doubt that technology has a huge role to play in law enforcement and our justice systems, there is a long way to go in deployment, with authorities needing to ensure a balance between computer-aided machines and the “human” element.